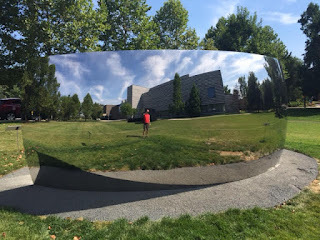 The Cleveland Museum of Art has a temporary installation from British artist, Anish Kapoor, who you might know better as the person who did 'the Bean' (or officially known as Cloud Gate) in Chicago. If our piece has a name, it's not listed anywhere that I can find. 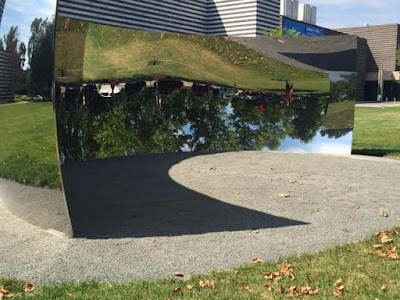 Cleveland has this Kapoor piece for a year, until July 2016. 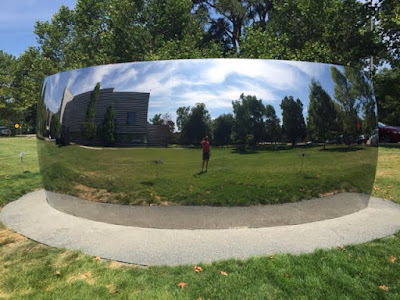 Yes, it is reminiscent of Cloud Gate in the material used and the reflections. We are not really bean-shaped. There is a convex and a concave side. And no super great way to get a super great picture. At least not without drones, step-ladders, hover boards or the like. Like the Bean, I think for all its simplicity, it is actually quite pretty. Or maybe I'm just distracted by shiny objects. The difference with the Cleveland piece - or one of them - might be that the Bean is installed on a cement and stone plaza. There is grass nearby, but not that close to the sculpture itself. The reflection has been such that the museum has stopped cutting the grass back around the art to a standard level, because the reflection of the sun burns and kills the shorter blades. In fact - it does more than that. You will need to enlarge the below image. What we all feared: Art Maims. I have seen pieces of art so bad that you'd wish you'd have lost your eyesight. But I've never seen a work that actually could rob you of it, lest you be careful. The warning triangle seems to be new. I've never seen that on anything else. 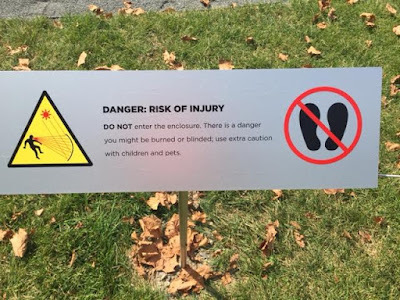 I love that some graphic artist had to develop this warning. Still, it's great we snagged this - even if it is just for a year. I'm enjoying the new director of the museum, whom I had a chance to meet the other week at a dinner. I hope there is more to come like this. 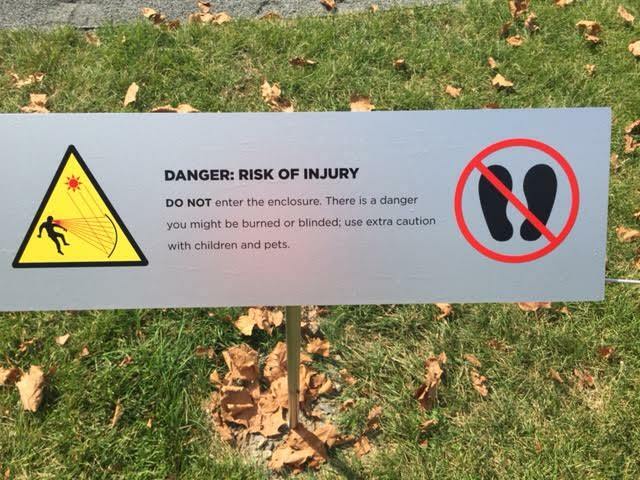 I mean, except for the retinal burns. And here I thought it was just pretty?